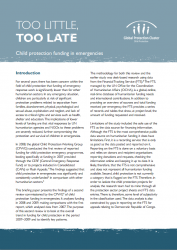 This brieﬁng paper presents the ﬁndings of a second review commissioned by the Child Protection Working Group (CPWG) of child protection funding in emergencies. It analyzed funding in 2008 and 2009, making comparisons with the ﬁrst report, which analyzed data from 2007. The purpose of this second review was to look at the overall trend in funding for child protection in the period 2007–2009 and to identify key patterns.